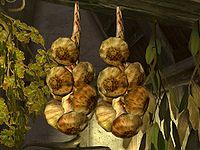 Garlic is harvested from garlic braids found hanging to dry inside homes and other buildings, typically side by side with elves ear and frost mirriam. It is not possible to harvest fresh garlic directly from plants. Garlic is also used in cooking, where it can be combined with other raw food to create beef stew, horker stew, or tomato soup. With the addition of baking in Hearthfire, garlic can be used with other raw ingredients to create chicken dumpling and garlic bread. Because it is used in cooking, it is also categorized as raw food, and therefore can be sold to innkeepers as well as apothecary merchants. This page was last modified on 9 April 2018, at 04:29.